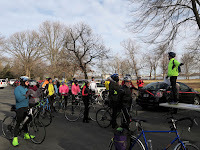 About 25 cyclists joined Mt Vernon District Supervisor Dan Storck this morning on the inaugural Tour de Mount Vernon. Thanks to Supervisor Storck for holding the ride and for his support of bicycling in Fairfax County. See photos of the ride on Supervisor Storck's Facebook Page. The route (see RideWithGps) was 22 miles to Workhouse Arts Center, returning by the same route for a total of around 44 miles. The group rode from Belle Haven Park starting around 10am. They headed south on the Mt Vernon Trail to Mount Vernon Estate. From there we rode along Mount Vernon Memorial Highway, initially on the poorly maintained trail and then on the road which has a narrow, paved shoulder. We stopped briefly on Mt Vernon Memorial Hwy and Supervisor Storck discussed his goal to build a paved trail from Mount Vernon Estate to Route 1 within 3 years. The trail would include using the bridge over Dogue Creek which has funding from a recent bond referendum. We continued across Route 1 and used the new, wide trail that parallels Jeff Todd Way, north to turn left on Telegraph Road which has bike lanes and a wide paved trail. We followed Telegraph all the way to a right on the Route 1 trail for a short distance and then right on Lorton Road which also has bike lanes and a paved trail. West of I-95 the road is being widened and the bike lanes will soon be striped after the final layer of asphalt is laid. At Lorton Station we passed a long line of cars waiting in the bike lane to turn right into the station to catch the Auto Train for the trip south to Sanford, Florida. We continued on Lorton Road to a left on Workhouse Road to follow the new trail. The Cross County Trail parallels Workhouse Road and once construction is complete it will be an option for reaching Workhouse Arts Center. Thanks to Supervisor Storck's staff for being at the rest stop at Kingstowne Fire Station 37 and at Workhouse Arts Center to provide water and snacks for the riders. We're looking forward to the next Tour de Mount Vernon. trails for bikes and foot traffic is incredibly important for not only neighbor-to-neighbor community-building, but also connecting what he called significant “cultural sites” for visitors, including the Mount Vernon Estate, the National Museum of the U.S. Army and Arcadia Farm on the historic Woodlawn Estate." 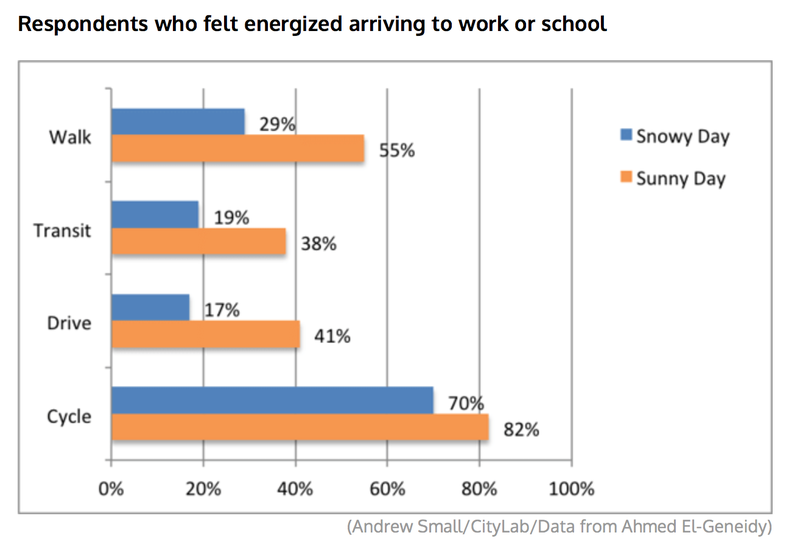 Check out this CityLab article by Andrew Small on the results of a recently released Canadian study that looked at multiple transportation options to determine what kind of commuters are more likely to feel energized and arrive on time. Needless to say, the virtues of bicycling commuting stand out. The study by McGill University’s Charis Loong, Dea van Lierop, and Ahmed El-Geneidy analyzed the commuting patterns of the students, staff, and faculty at the school located in downtown Montreal, surveying 5,599 people at the campus in 2013. The survey asked participants how they commuted to campus—walking, cycling, driving, or taking public transit—and paired those patterns with their responses of feeling energized and whether their commute negatively impacted their punctuality. Active forms of transportation leave people feeling energized. People-powered commutes tend to be more punctual. The study found that multiple factors affected commuters’ punctuality and energy level, including the travel time, comfort, safety, consistency and reliability associated with the various transportation infrastructures. FABB continues to advocate for better infrastructure to improve the consistency, reliability, and safety of bicycling facilities to enable riders of all ages to bike in comfort and with confidence. Partnership for Active Transportation is a diverse coalition of active transportation and smart growth organizations "working together to create healthier places for healthier people by supporting increased public investment in walking and bicycling as essential modes of transportation." They have developed a list of active transportation recommendations for the Trump administration. Provide safe routes to everywhere for everyone by building trail and active transportation networks in communities of all sizes and types across America. Fuel economic development, attract tourists, reduce health-care costs and aim to eliminate tra c deaths, particularly among pedestrians and bicyclists. Mt Vernon Supervisor Dan Storck began his term on the Fairfax County Board of Supervisors in January 2016. Before then he was a member of the Fairfax Co School Board. He has been a supporter of FABB's efforts to promote biking and walking to school. 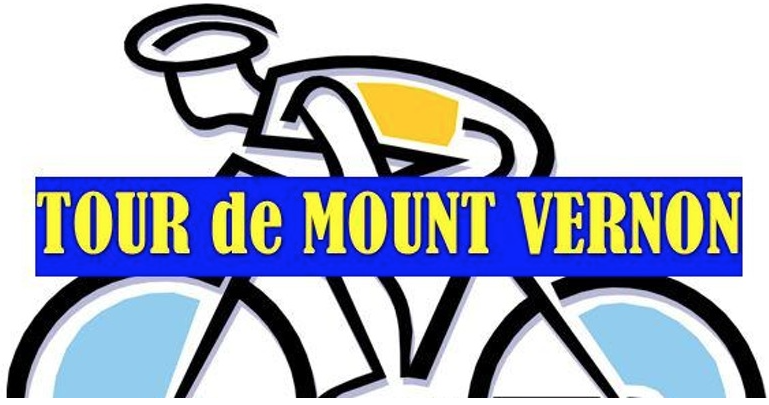 We were excited to learn that Supervisor Storck is leading a bike tour of the Mt Vernon District on New Years Eve day, the inaugural Tour de Mount Vernon. The ride starts at 9:30 a.m. leaving from Belle Haven Park. You can register on eventbrite. This is a great opportunity to meet Supervisor Storck, discuss cycling conditions in the Mt Vernon District, and likely learn some local history. Supervisor Storck is known for his distinctive beard that he grew for his role as Abe Lincoln in the Alexandria parade many years ago. He continues to play the role on occasion. Read Supervisor Storck's First Person Singular account in the Washington Post. 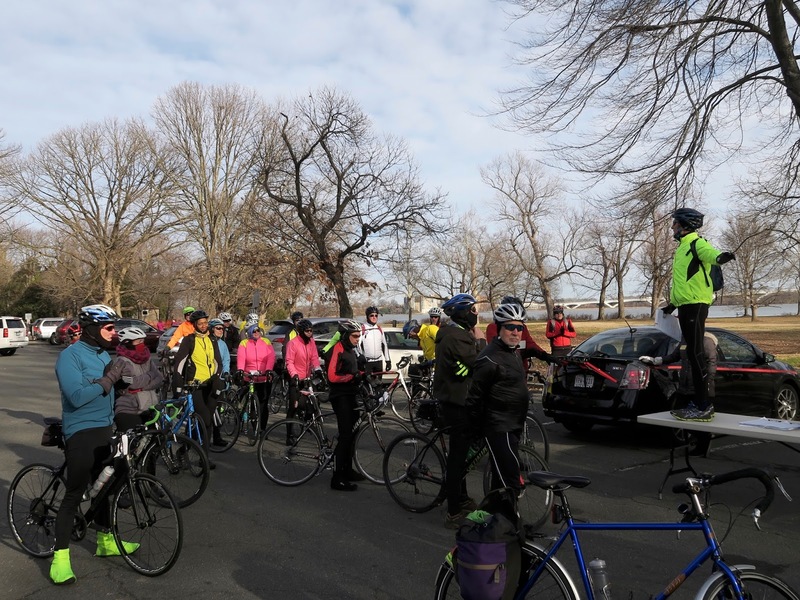 On Saturday, December 31 at 9:30 am join us for the last ride of the old year as we hold our inaugural Tour de Mount Vernon bike ride! This informal bike ride is open to all who want to join us and begins at Belle Haven Park on the George Washington Parkway (GWP). The 25 mile one-way or 50 mile round-trip ride follows the GWP trail to Mount Vernon Estate and continues on ultimately ending at the Workhouse Arts Center. Click here for more details and to sign-up. We look forward to seeing you on December 31st for our inaugural ride through the historic Mount Vernon district. Join FABB on Wednesday, Dec. 21 at 7:00 p.m. at Mad Fox Brewing Company, 444 W Broad St Suite I, Virginia. Instead of our a regular meeting we want to the great work our volunteers and supporters have accomplished in 2016, our first year of being an independent non-profit. We also want to celebrate progress the county is making, with several miles of new bike lanes, and the county's first bike sharing systems in Reston and Tysons. Cash bar. Casual dress. Finger food provided. Please RSVP. See the Mad Fox Brewing Co Directions page for details about bike and car parking. We were saddened by the news of the passing of Providence District Planning Commissioner Ken Lawrence. Commissioner Lawrence was very supportive of bicycling as an important mode of transportation. We met Commissioner Lawrence when we served with him on the Tysons Land Use Task Force. He understood that bicycling can be one of the solutions to the last mile problem when accessing transit and he was a key supporter of the Tysons Bicycle Master Plan. Most of the core of Tysons is in the Providence District. In 2007 when FABB sponsored the Tour of Tysons to show Fairfax officials and others what it was like to bike in Tysons, Commissioner Lawrence and Supervisor Smyth greeted us before the ride. When Fairfax County was developing the first Bicycle Route Map, Commissioner Lawrence attended one of the public meetings where cyclists marked up maps to help develop the first draft of the map. Commissioner Lawrence was a kind man with a good sense of humor who could be counted on to provide sage advice on how Fairfax should grow in the future. He'll be missed. Kenneth Lawrence was appointed by the Board of Supervisors (on a motion by Supervisor Linda Smyth) to serve as the Providence District Planning Commissioner in January 2004 to complete the term of his predecessor. In January 2013, Commissioner Lawrence was reappointed by the Board of Supervisors to his third consecutive term, which will expire in December 2016. Commissioner Lawrence is an active member in various community organizations. He has chaired the Briarwood Citizen's Association Land Use Committee and served as the Briarwood representative on the 2001 Area Plan Review task force. He also chaired the work group on the Fairlee out-of-turn plan amendment in the Providence District. In addition, Commissioner Lawrence is a member of the Northern Virginia Family Services' Training Futures Advisory Council and an active volunteer with the American Lung Association of Virginia, serving as a member on the Government Relations Committee. 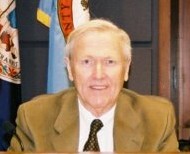 Commissioner Lawrence retired in 1998 from a 40-year career in private industry and the federal government. He began his career conducting training device design and human factors research, which ultimately led to a focus in instructional design. His work ranged from developing single units to entire courses in technical and procedural training, employee development and employee performance support, and the target populations for the training included members of the military, sales staff, procurement and tax specialists, and research managers. In 2016, Lawrence chaired the Tysons Committee. In addition, he was a member of the following committees: Environment, Land-use Process Review, and Transportation. He was an alternate member of the Telecommunications Committee. Lawrence has been a Virginia Certified Planning Commissioner since 2005. He was featured in the August 2007 Planning Communicator, which is available online at: http://www.fairfaxcounty.gov/planning/august2007newsletter.pdf. If you use the Fairfax County Parkway or Franconia-Springfield Parkway trails, Fairfax County DOT wants you to fill out a Parkway survey about your priorities for those roads/trails. Unlike the W&OD Trail, the parkway trails do not have a manager or a dedicated budget for maintenance or to ensure that safe access is a priority. While FABB worked with VDOT to fund maintenance for the northern half of the trail two years ago, work on the souther half has stalled. Many of the street or ramp crossings are dangerous, with limited sight distance, speeding motorists, and motorists turning right on red without looking right. If you use or would like to use the Parkway trails, please consider filling out the short 11-question survey and tell VDOT to do more to make biking along the Parkway trails safer and more convenient. When we filled out the survey we asked for dedicated funding for trail maintenance (including snow plowing), better, grade-separated ramp crossings, and ensuring that a safe, well-maintained trial is a priority. 1. Where do you live (neighborhood)? 2. On an average weekday, how do you currently use Fairfax County Parkway and/or Franconia-Springfield Parkway (the Parkways)? Check all that apply. 3. What time of day do you typically use the Parkways? Check all that apply. 4. How far is your typical trip on the Parkways? 5. How many times a day do you use the Parkways (enter a number)? 6. How would you like to use the Parkways? Check all that apply. 8. What strategies would you like to see for meeting the future transportation needs along the Parkways? Check all that apply. 9. Should the Parkways have a consistent design or have area specific designs? Does a drive end-to-end along the Parkways need to have the same feel or should it change depending on the location? 10. What strategy should be considered for the potential widening of the Parkways? Check one of the following. 11. What other comments or suggestions do you have regarding the goals and objectives of the long-term planning study? It's that time of year. End of year gatherings. Sharing good times about bikes. Please join Fairfax Alliance for Better Bicycling as we honor all the great work our volunteers and supporters have accomplished in 2016, our first year of being an independent non-profit. Come celebrate bicycling in Fairfax with all our friends and partners. When: Wednesday, Dec 21 at 6pm 7-9:30 p.m.
Fionnuala Quinn became involved in FABB in 2008. She was a critical part of FABB's early successes, including helping us advocate for passage of the Bicycle Master Plan, being primary author of the award-winning publication Guide for Reviewing Public Road Design and Bicycling Accommodations for Virginia Bicycling Advocates, and many other activities. Fionnuala Quinn is a licensed civil engineer with a background in bicycle and pedestrian planning and advocacy. 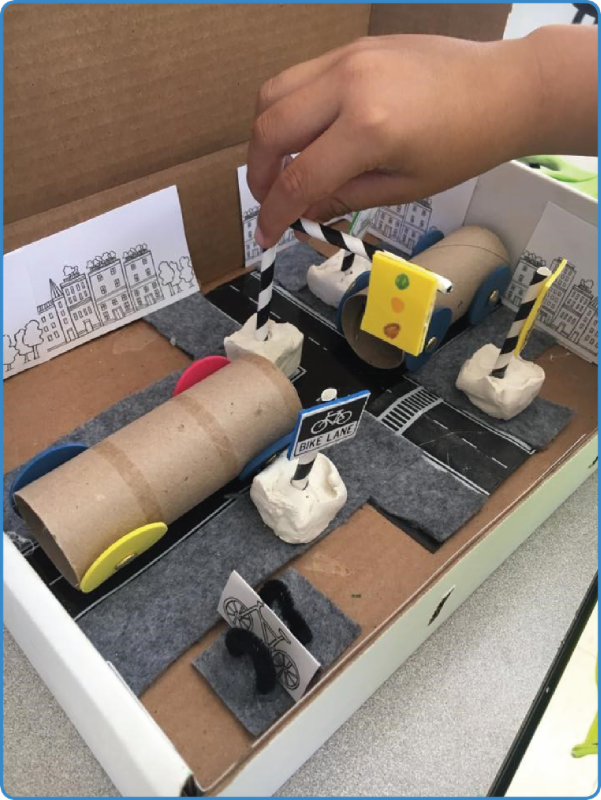 Through her recently launched organization, The Bureau of Good Roads, she is working to spark interest in how students can influence the design and operation of public streets and the built environment. She hopes her work can inspire young people to play a role in designing streets to better serve the needs of all members of the community. Why did you launch the Bureau of Good Roads? I launched The Bureau of Good Roads for several reason. First, through my work as a bicycle and pedestrian engineer and advocate, I recognized a need to engage and educate local communities about the public realm (of which streets are a large part). Often times, I witnessed community members get involved with infrastructure projects only when the projects directly affected them, rather than taking a broader community view of the public realm. Second, I have worked to promote STEM and STEAM (Science, Technology, Engineering, Art, and Math) education for over 10 years starting initially with a weekly girls engineering program at a local elementary school. 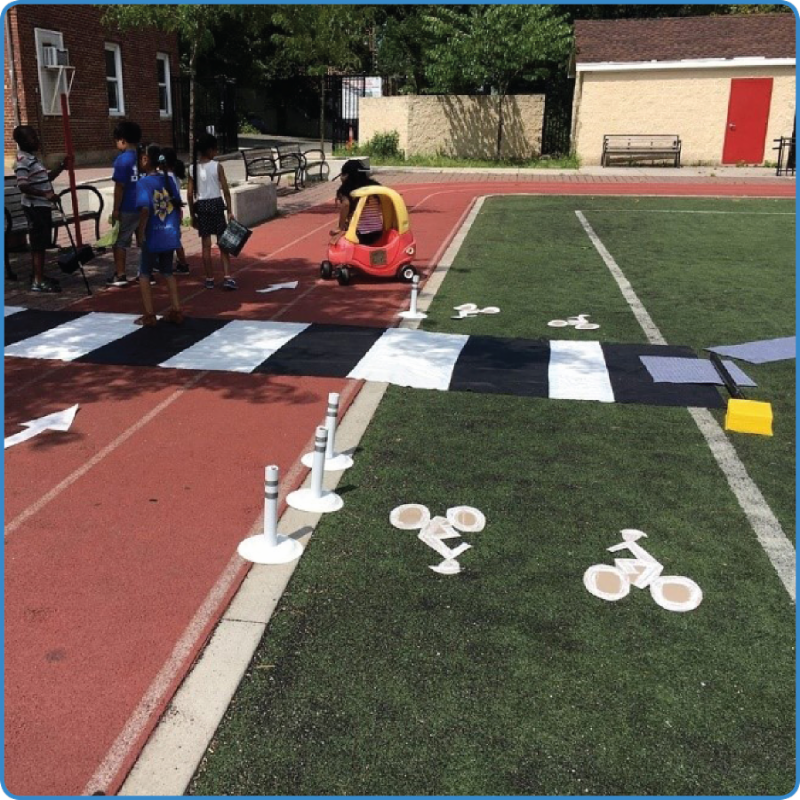 Walking, bicycling, and school-zone infrastructure are a perfect way to relate STEAM principles to everyday life. Finally, my historical interest in the development of streets led me to a career in engineering and planning and this new way to use my career directly benefits the next generation of leaders. What resources does the Bureau of Good Roads offer? 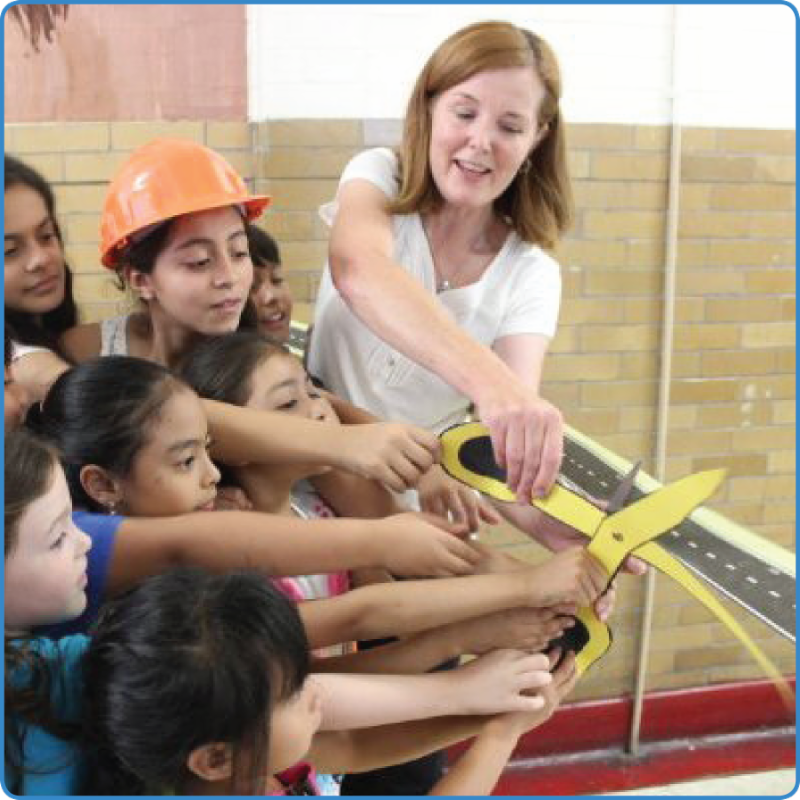 The Bureau of Good Roads holds workshops, leads educational programming, and publishes free lesson guides and materials online aimed at students ages 7-13. Our workshops aim to educate and engage students. For example, the Good Roads Rangers Club is a weekday camp program focused on building places and cities for people of all ages and abilities. The Sidewalk Superintendents is a field workshop investigating how infrastructure, design, and safety relate. The lessons guides cover topics such as sidewalk closures, street festivals, street connectivity, street signs, and more. Lessons typically utilize recyclables or low-cost materials to help ensure lessons are accessible. via the hands-on Complete Streets kit. We are currently working with an established program in Middleburg (Team Saturday) to create complete streets toolkits. Students are developing these toolkits, which will be presented to town officials in February, in order for Middleburg to help explain different traffic calming techniques to local residents. Middleburg has been great to work with and Town Administrator, Martha Semmes, joined the students to discuss the impacts of a local traffic calming project. What materials are you currently developing? I want all of the materials to be easily accessible and help improve understanding of our transportation systems. I am developing a set of basic design principles which will represent the key complete street principles. These principles highlight that the world around us is designed for our use, design is an iterative process, the built environment can be altered, infrastructure is a connected network, and change is normal for example. If students, parents, and community members understand these principles, then the quality of the built environment should improve. How can VA SRTS Coordinators contact you? For more information about The Bureau of Good Roads and to access free materials, please visit www.goodroadsmovement.com or www.facebook.com/GoodRoadsMovement. If you would like to partner with the Bureau of Good Roads, please contact Fionnuala at info@goodroadsmovement.com. Join The Bureau of Good Roads Newsletter! Update: Fionnuala will participate in the FABB Advocacy Training on Feb. 4. Details and registration info coming soon. She will also be the featured speaker at the March 15 FABB meeting in Vienna where she'll discuss her work with the Bureau of Good Roads. Now taking Bike Lessons requests for 2017-18 school year. Priority given to schools that have not had the bikes. We have 29 BMX bikes, 40 Mountain bikes and 7 balance bikes in our inventory to take to schools. 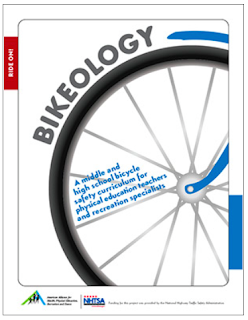 We generally teach two basic lessons based on the Bikelogy Curriculum from SHAPE America and Bike Smart Virginia. The first lesson after going over helmet fitting and ABC bike check is a set of stations where students practice specific skills such as weaving, looking over your shoulder, riding over debris, stopping and starting, signaling and circling. Students usually get this lesson twice in order to get plenty of practice. Some schools only have 30 minute classes and we have to really move fast to cover the content. The second lesson is called city streets and this simulates an intersection with stop signs as well as an outer highway or beltway. Students practice stopping at stop signs, yielding to traffic, riding in groups and making decisions. We also do this lesson twice. New riders are pulled to the side and work on balance bikes until they are ready for a pedal bike. Once they have control of the bike and confidence, they rejoin the large group lessons. About 10-20% of each class does not know how to ride when we start. We are at the elementary schools for 2 weeks and at the middle schools for about a month. The middle school students go through the same protocol but then add learning about shifting the gears, trail riding/group riding, riding for fitness and some bike maintenance. The two week window for grades 4-6 allows us to hopefully see the students at least 4 times. Schools are given a handout called “Bicycle Safety What Every Parent Should Know” to send home with each student. Currently Rose Hill ES, Hollin Meadows ES, and Greenbriar West ES have bikes (30 each) bought through SRTS funding. Belle View ES bought their own bike through a generous donation from a parent. All these schools are willing to share their bikes with other schools. Franklin Middle School will be receiving bikes (40) after the new year for their school. We are trying to build capacity and train teachers to have the bikes at their school so that they can have them without support from FCPS SRTS. Most teachers can handle teaching the lessons, it is difficult to manage repairs (fixing a chain or adjusting brakes), new riders and teach the lessons. At the end of this school year we will have visited 23 schools for lessons in school and have plans for a least two more Saturday or after school rodeos. Check out this CityLab article on Vancouver’s success in nudging drivers out of cars. The city now reports that fully 10 percent of commutes to work in Vancouver are on bikes, a figure that far exceeds results of all other U.S. and Canadian cities of comparable size. By last year half of all trips within Vancouver’s city limits were taken on bike, foot, or transit—a goal the city had hoped to reach by 2020. 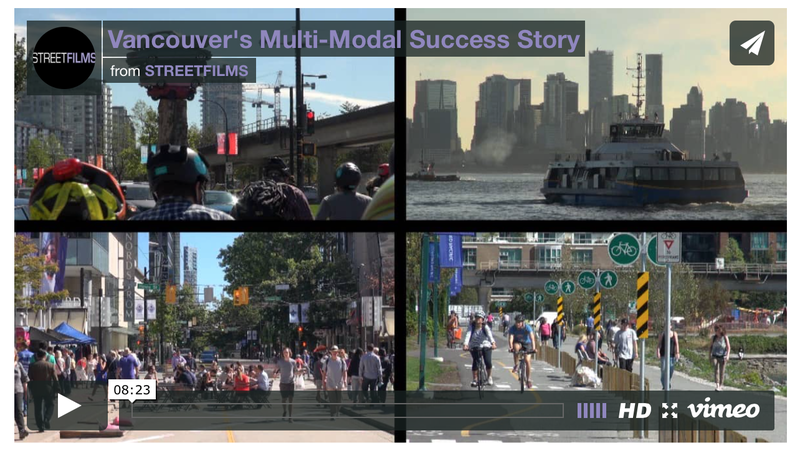 The article includes a roughly 8-minute video that covers Vancouver’s “active transit” success and shows how the city managed to avoid the planning pitfalls that harm so many other cities’ efforts. On Tuesday, 13 December, the City of Fairfax is holding a meeting to decide whether to move forward with the extension of University Drive north of Fairfax Boulevard, a project that will include the creation of bike lanes on both sides of the street. The meeting begins at 7:00 pm at Fairfax City Hall, 10455 Armstrong Street, and FABB encourages its City of Fairfax members to attend and speak in favor of the extension. In June the City was awarded nearly $10 million in federal funds through Virginia's competitive SmartScale program for the extension. The project is an important part of efforts to revitalize Fairfax Boulevard as a more walkable and bikeable destination. Many residents along and near University Drive have expressed concerns about the proposed extension’s impact on safety. Such concerns are understandable, but many of the safety issues already exist and the City is planning and implementing new measures to make University Drive safer. For example, the City has added an in-street crosswalk sign at the intersection of University and Stratford Avenue and made it a four-way stop. 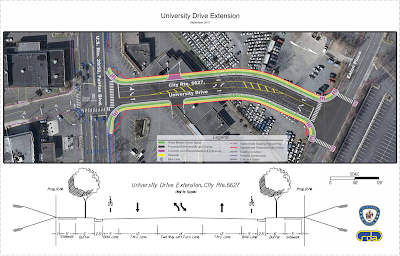 The University Drive extension is just one part of larger plans to make the City of Fairfax more walkable and bikeable by creating a more connected street network. The City has also secured funding to extend Government Center Parkway from Stevenson Drive to Jermantown Road, which will connect the western side of the City with the Government Center/Fair Lakes area and include bike lanes. The past twelve months have been momentous ones for FABB. Our advocacy group reached a major landmark when it became an independent 501(c)3 nonprofit in March during one of its busiest and most productive years ever. Please consider a tax-deductible end-of-year donation to FABB to help us go even farther in 2017. For those who have already made a donation, we offer our most sincere appreciation and our assurance that your dollars go a long way. Come Celebrate With Us. Please join us on Wednesday, December 21, 2016, to celebrate our continuing progress in making bicycling better in Fairfax County and to recognize some of our members, partners, and new found friends for their contributions to making the past year so productive. The celebration starts at 7:00 pm at the Mad Fox Brewing Company, 444 W Broad St in Falls Church. There will be finger food and a cash bar. The following is a summary of major FABB- and bike-related milestones during the past year. New Board and Name. The newly established FABB Board of Directors began its work in January and has been very active all year. Board officers are Jeffrey Anderson, President; Sonya Breehey, Vice President; Steve Ward, Secretary; Howard Albers, Treasurer; and At-Large Members Bruce Wright, Alan Young, and Douglas Stewart. FABB also made a change to its name, becoming the Fairfax Alliance for Better Bicycling to better reflect our goal of strengthening our advocacy by working more closely with other bicycling and related groups. Local Outreach. 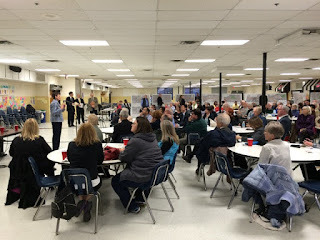 To engage more Fairfax cyclists and bicycling supporters, FABB began rotating its monthly meetings between its usual Vienna venue and all of the county’s districts. These meetings’ successfully focused on local projects, pressing needs and advocacy opportunities. Many of our discussions in the districts, such as those in Braddock, Lee, and Dranesville, were complemented by presentations and discussion by the districts’ supervisors or members of their staff. Alliances. FABB has worked hard to join with like-minded organizations to promote better bicycling throughout the Greater Washington region. We believe our voices are more powerful when we collaborate with others. FABB continues to work with WABA, our former sponsor, and long-time ally Reston Bicycle Club. We started cooperating with a wide range of other groups, including the Potomac Pedalers, Active Prince William, Sports Backers of Richmond, People for Bikes, Mid-Atlantic Off-Road Enthusiasts (MORE), the recently formed Capital Trails Coalition, and local bike shops, particularly The Bike Lane. FABB continues to work closely with the Fairfax County Department of Transportation Bicycle Program, and this year teamed up for a benefit event with the county, Celebrate Fairfax, Visit Fairfax, and the Workhouse Arts Center. FABB also is engaged with the Fairfax County Police Department on enforcement and education efforts. National Bike Summit. In early March FABB members attended this three-day League of American Bicyclists event in Washington, DC. They attended advocacy workshops and networked with other Virginia advocates (BikeWalk RVA, Virginia Bicycling Federation, BikeArlington, etc.) and other groups from around the country. Capital Bikeshare. FABB has been active in advocating for and then promoting the arrival of Capital Bikeshare to Fairfax County. The Bikeshare system, which launched in late October, allows a person to check out a bike and ride short to moderate distances from station to station. 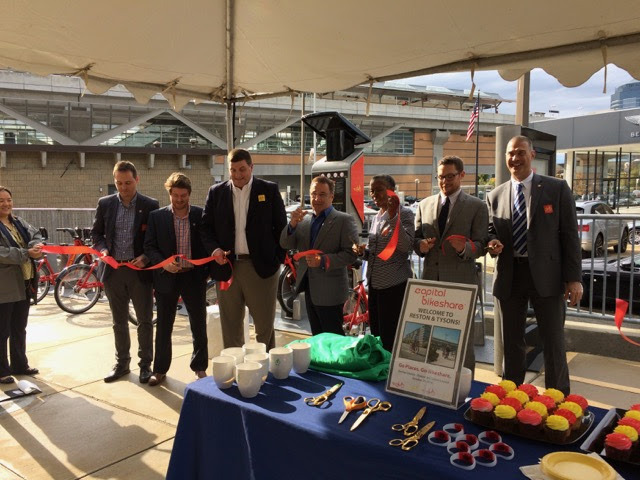 Twenty-nine Bikeshare stations have been installed in Tysons and Reston. Plans are now underway to expand the network to Falls Church. Events. FABB participated in so many events in 2016 that we cannot do justice to them in this annual review. Instead, we encourage you to check out the FABB blog for details. Here, however, are some of the highlights. During April and May we were out in force to support Bike to Work Day pit stops, help WABA with New Belgium Brewery’s Tour de Fat, and represent bicycling at Fairfax County’s SpringFest. In July FABB supported the “Bike for Your Right” Richmond to DC Ride to demonstrate our area’s strong support for bicycling in the Commonwealth. We worked with the Potomac Pedalers and Active Prince William to promote bicycling at Fairfax County’s first Brewfest, a celebration of regional craft breweries, at the Workhouse Arts Center in Lorton in August. During the fall, FABB conducted a social ride to introduce area riders to Meadowlark Gardens Botanical Park and NoVi (Northern Vienna) Trail network. 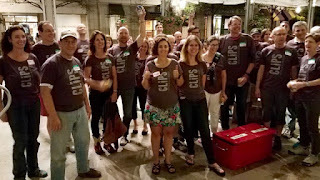 We also promoted the People for Bikes Draft Meetup networking event. Our fantastic FABB Clips volunteers. Clips. Our most important event and major fundraiser was the New Belgium Brewing Company’s Clips Beer and Film Tour, which FABB volunteers and The Bike Lane helped bring back to Reston Town Center in September. Crowds of visitors got to try some of New Belgium’s more exotic beers while enjoying short films celebrating the brewery’s twenty-fifth anniversary. Youth Programs. FABB continues to support programs that encourage bicycling among children and was pleased to see the continued growth of events such as Bike to School Day in May. 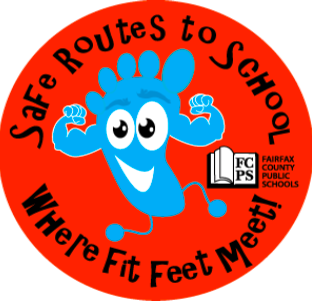 In 2016 nearly 70 Fairfax County elementary and middle schools participated in the event. Fairfax County Public Schools encouraged increased ridership by handing out backpack tags to participants at the elementary schools and cinch sacks at the middle schools. Fairfax County Police Department bike patrol officers led three bike trains to WolfTrap Elementary in Hunter Mill District while other officers assisted at Hunter Woods and Sunrise Valley Elementary Schools in Reston. At Dogwood Elementary, riders received assistance from the Reston Bike Club with minor maintenance and helmet fit. Later in May students at Vienna area elementary schools participated in the annual Walk Bike Challenge Week and clocked a combined 6,473 trips to school by foot, bike, skateboard and scooter. Of those trips, 1,250 were by bicycle. This was the 4th year in a row students have exceeded 5,000 trips, and the second time they’ve topped 6,000. Infrastructure Projects and Hearings. FABB continued to lead efforts to ensure that new transportation projects include bicycling facilities. In 2016 our members and other supporters came through big time in attending public meetings and sending comments to VDOT and public officials. The number of local projects and proposals FABB covered this year was extensive. 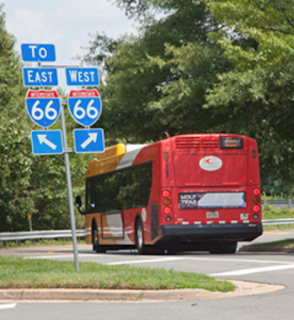 The I-66 Outside the Beltway improvements program now includes a corridor-wide bikeway and pedestrian plan that, according to VDOT, was developed because of substantial public interest. Grade-separated ramp crossings for the Route 7 bridge over the Dulles Toll Road are now under construction. 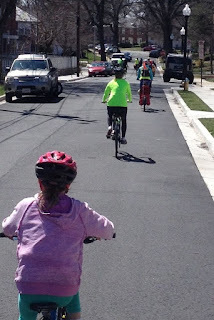 Fairfax County added more than 15 miles of new and upgraded bicycle lanes through the summer repaving program in Braddock, Mason, Mt. Vernon, and Lee Districts. Hearings and planning this year included bike lanes in Annandale, Braddock Road, Hunter Mill, and Little River Turnpike, improved bike access to the Vienna Metrorail Station, a bridge on the W&OD Trail over Wiehle Avenue in Reston, W&OD Trail lighting in Herndon, and facilities for the Embark Richmond Highway project. In addition, two parallel trails on each side of the highway are part of the plans for the Route 7 Widening project from Reston to Tysons. 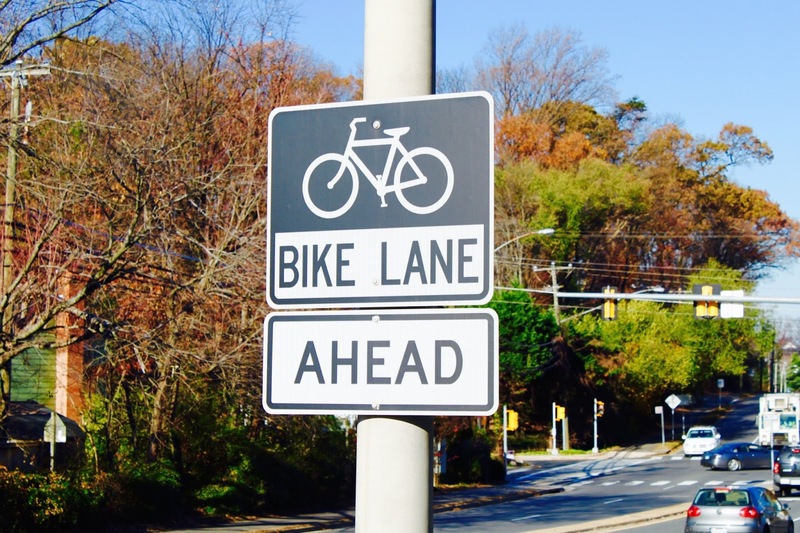 Attention is now being turned to improving bicycling infrastructure along the Fairfax County and Franconia-Springfield Parkways. SafeTrack. FABB has promoted bicycle commuting in response to public transportation disruptions caused by Metro's SafeTrack repair program, which started in early June and will continue into early 2017. There was an observable increase in biking as commuters took their bikes to avoid SafeTrack delays. Vienna Named Bicycle Friendly Community. The Town of Vienna was designated a Bronze Bicycle Friendly Community by the League of American Bicyclists. Bronze, the lowest of five levels of bike friendliness, indicates that important steps are being taken by the community in the five areas of Engineering, Education, Encouragement, Enforcement, and Evaluation. Along with Reston, Vienna has become the second bicycle friendly community in Fairfax. Bike/Pedestrian Staff. 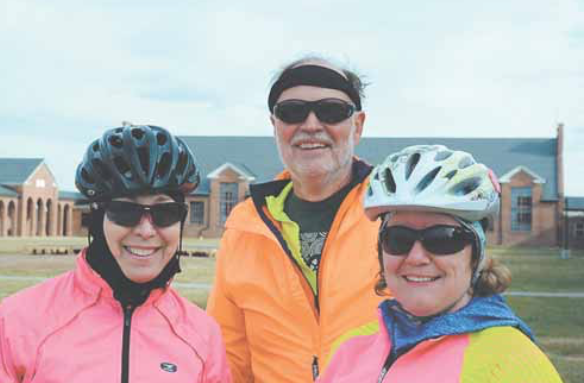 Nicole Wynands and Lauren Delmare joined the county’s bicycle and pedestrian programs this year. As of this writing Fairfax County is trying to hire a Pedestrian & Bicycle Program Manager to oversee the bicycle program managed by Adam Lind and pedestrian program managed by Chris Wells. New Bike-Related Law in 2016. In July Virginia joined Maryland and the District in having a law that helps protect cyclists from “dooring.” The dooring law requires drivers to wait for a reasonable opportunity to open vehicle doors on the side adjacent to moving traffic. A violation constitutes a traffic infraction punishable by a fine of not more than $50. FABB Board President Honored. Jeff Anderson was honored this year by Volunteer Fairfax as the Hunter Mill District Community Champion for leading FABB's Safe Routes to School work, which encourages more kids to bike and walk to school. Finally, thanks to all of our FABB members and supporters who helped make 2016 so productive. As an all-volunteer organization, FABB relies on supporters like you to donate their time to improve bicycling in our neighborhoods and around the County. Please visit our volunteer webpage to learn about specific opportunities and get in touch with us. We’ll find the right fit for you. Warmest wishes for everyone to have a safe, happy, and prosperous 2017. If you don't have a PayPal account go to the bottom of the page to use your credit card. 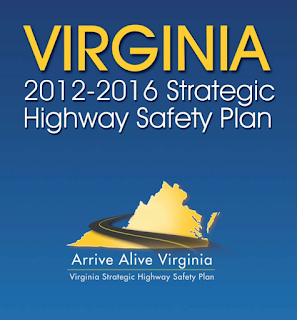 FABB members Kelley Westenhoff and Alan Young provided the following report on the Virginia Strategic Highway Safety Plan Regional Safety Roadshow on December 1, 2016. The big news is that bicycles and pedestrians are now part of the areas of emphasis in the safety plan, although VDOT officials admitted that these areas suffer from underreporting and data gaps. The Roadshow seeks to inform the public and solicit citizen feedback on the Safety Plan, which is to be presented to the legislature next year. 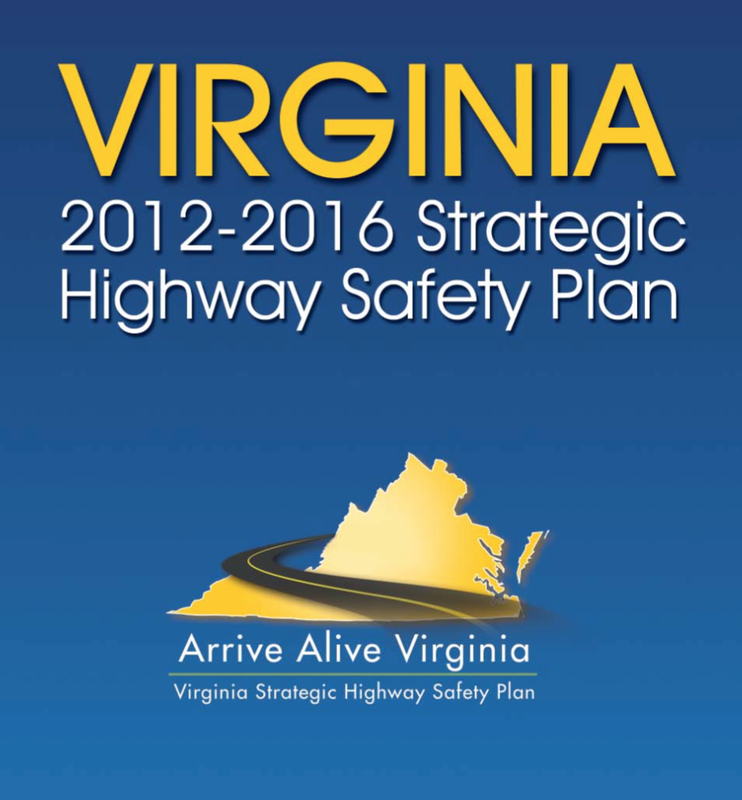 This new 5-year plan is Virginia's answer to the national Vision Zero movement. The plan's goal is to reduce fatalities and the fatality rate by 2% per year and serious injuries and the serious injury rate by 5% per year. The VDOT effort is encouraging, but the plan is complicated with hundreds of actions to be completed in the six primary areas of emphasis (speeding, young drivers, occupant protection, alcohol-related incidents, roadway departure, and intersections) and the bicycling and pedestrian areas. On the plus side, there are two dedicated pots of money for highway safety. The Highway Safety Improvement Program (HSIP) funds infrastructure projects while the Highway Safety Plan funds programs and activities that affect behavior (for example, Click It or Ticket, education programs, and PSA campaigns). The plan is based on data collected by VDOT on fatal and severe injury crashes, which the department then used to create heat maps showing where and what kinds of crashes have occurred. The data is further analyzed to determine work priorities for reaching safety goals. The data for the Northern Virginia region for 2010-2015 shows that from a total of 6,572 crashes there were 235 bicycle crashes and 747 pedestrian crashes. Intersections are a major problem, if not the major problem, in our region for all traffic, including bicycles and pedestrians. Young, aging, distracted and impaired drivers are the next most significant problem areas for crashes. VDOT officials stated that while bicycle and pedestrian incidents are a small percentage of overall crashes, VDOT broke them out as a separate category to make them more visible and to emphasize the importance of studying improvements for ped/bike infrastructure and safety. In the Bicycle Emphasis Area recommendations to identify where to apply bicycle safety countermeasures, enforcement, and bicyclist and motorist education have been developed. VDOT officials recognize that better data on bicycling is needed and said an effort is underway to use information available in emergency response data to fill this gap. VDOT is looking for volunteers to serve on statewide and regional safety committees. If you would like to participate and help insure that Virginia increases the attention given to bicycle and pedestrian safety, please contact FABB. We can help with matching your interests with VDOT’s needs and with support for your participation. You can make a big difference! Get in the holiday spirit and join us for some festive family fun! Wear your warmest Christmas attire and listen to sounds of the season as we ride along the W&OD to the Reston Town Center Christmas tree. Hot chocolate and treats to follow the ride. Children need to bring their own bikes but there will be a few bikeshare bikes available for adults on a first come, first serve basis. Free 24h bikeshare memberships will be provided. Ride at your own risk. Participants under the age of 15 are legally required to wear a helmet. On Monday and Wednesday the Virginia Department of Transportation (VDOT) will host hearings to allow the public to review and provide comments on the preliminary design plans and Environmental Assessment for the Transform 66 Inside the Beltway Eastbound Widening Project. The project involves adding an eastbound travel lane on I-66 from just east of the Dulles Connector Road (Route 267) to Fairfax Drive/Glebe Road (Exit 71). All hearing times are from 6:30 until 8:30 p.m., with a brief presentation beginning at 7 p.m. If unable to attend, you can review project information and leave comments at www.Transform66.org.